plus the release of NEW Ai Spinners!!! I am thrilled to be playing with products from Art Impressions again! If you arrived from Kirsi Kamppikoski's blog you are on the right track. If not and you are just visiting today you can find the complete Blog Hop order below. 4695 - Pumpkin Spinner Dies to work with. I haven't done much papercrafting in the last 2 years and truly miss it! I thought it might be fun to add in a little mixed media to my project today so I could bring two of my loves together--past and present! For the base of my card I used a piece of Bazzill Orange Peel Texture (my FAVORITE cardstock) in the Mardi Gras color along with 2 sheets of deli paper that I Gelli printed with two StencilGirl stencils. Doodle It Tornado Bloom and Connected Eyes. The base of my card was extremely easy! I wanted to keep it simple because this project is all about the Spinner! I cut my cardstock to A2 size (4.25" x 5.5") and layered with a piece of my Gelli Print (4" x 5.25"). In an effort to use up my scrapbooking stash I used a felt sentiment that I have had for literally YEARS! Some gold pen work and called it done! 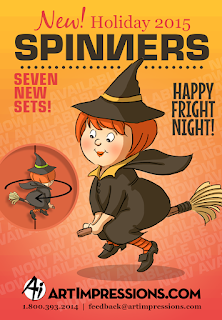 4695 - Pumpkin Spinner Dies! I used a cut n' boss to cut out my stamped images, but any die cutting system will do! Oh these dies!!!!! Where were you when I was designing for Ai???!!! LOVE, LOVE, LOVE!!!!! The above photo in orange shows you my actual images but underneath I wanted to give you a little step-out of my process so I did it on plain white paper. 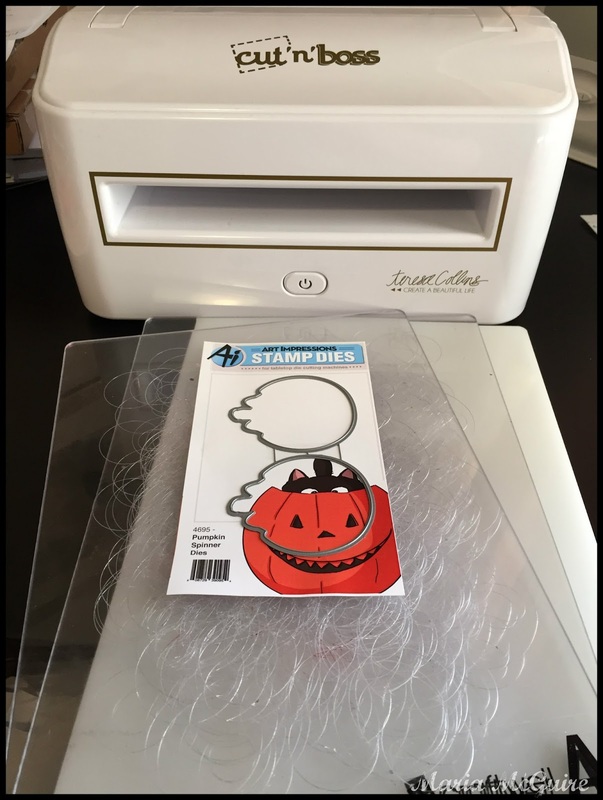 Lay stamps on acrylic block and position them by placing the die (cut side up) over the stamps. This way the stamped images will be in perfect position to cut. Stamp images. Now lay die (cut side down) over the stamped images. Perfect fit! I used a bit of washi tape to hold in position. Run through die cut machine. With the cut n' boss system I used a sandwich of A, image/die A and B. Machines will vary. As you can see PERFECT cut! How easy is that! Now that I had my perfect pumpkins, I used a variety of markers and pens to color them in. Being that I used deli paper (that is very thin and see through) for my Gelli prints I wanted to reinforce these. 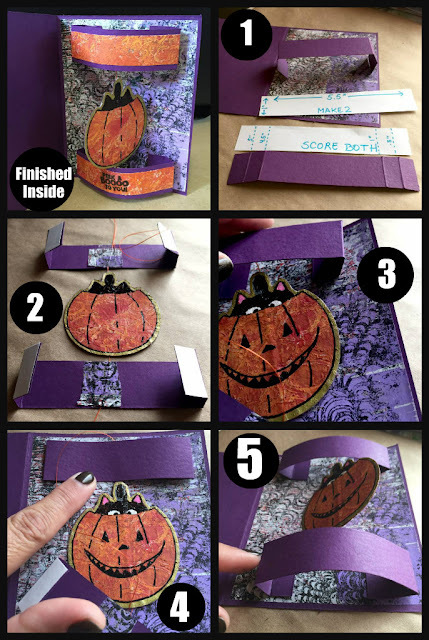 I cut out another pumpkin from the Bazzill cardstock and sandwiched it in between. Before I did, I used some Scor Tape adhesive and heavy orange thread to make my spinner. Time to assemble my spinner. 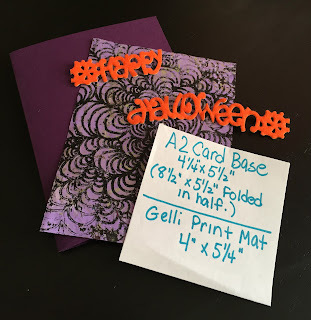 I used another (4" x 5.25") piece of the purple Gelli Print for the inside base of my card. Cut two pieces of purple cardstock each 5.5" x 1". Score both (from right hand side) at .5", 1", 4.5" and 5". Fold at score lines. Place adhesive ONLY on the first scored section on each end. See visual below. 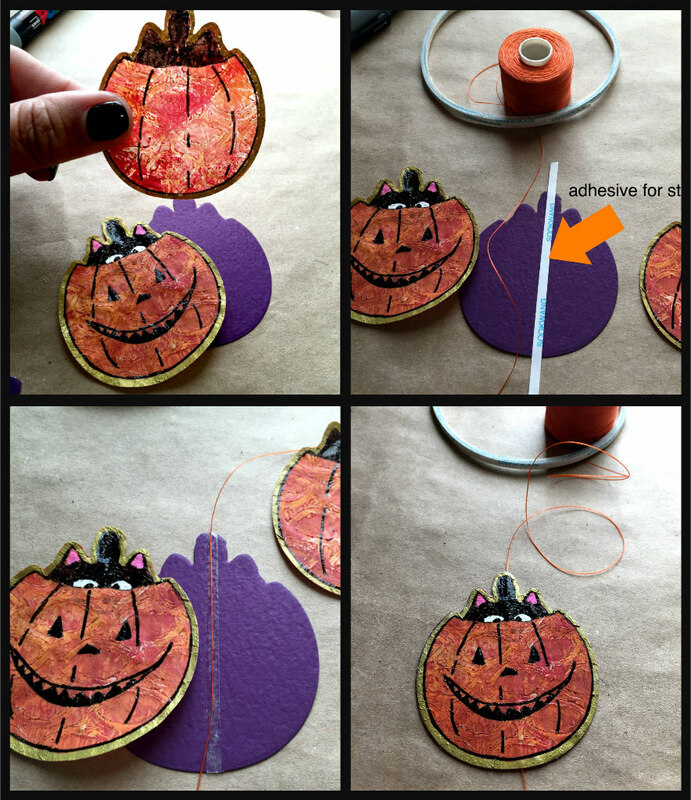 Adhere thread to strips of cardstock as seen in photo above. I reinforced the string with another little piece of Gelli print glued over. Adhere strip to card base as seen in photo above. and then POPS UP! when the card is opened. A few notes: I did go on to embellish my strips on the inside of the card with leftover scraps from the pumpkin gelli print. The sentiment (included in the stamp set) was stamped on the gelli print. Before you close the card, twist the pumpkin on the thread around and around until tight. Then when the recipient opens it will SPIN around and around!!! What a FUN card to make! Thanks Ai for always having innovative ideas! If you would like to see a sampling of just a few of the other cards I made for Ai in the past you can see them HERE. Make sure you click below to enter to WIN! Ready for your next stop??? 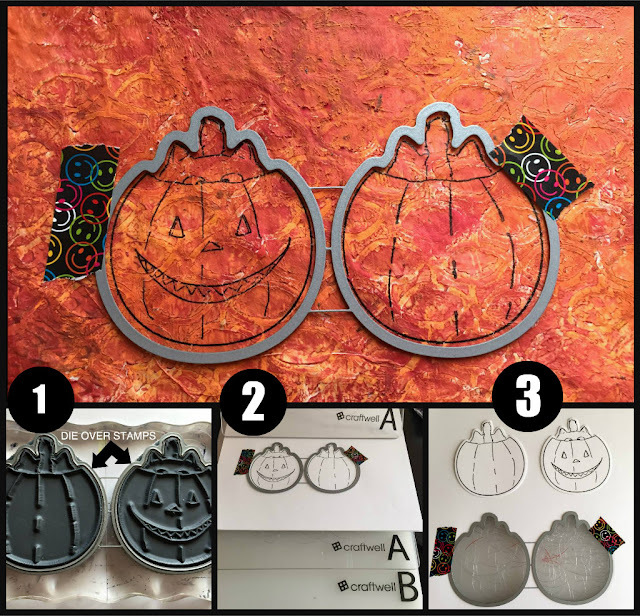 Head on over to Marie-Pierre Capistran's blog and see what she made!!! Marie-Pierre Capistran Go Here Next!!! Super cute card! Very creative how the spinner is on the inside of the card! I sure do appreciate the tutorial as well! Thanks for the detailed tutorial. You make it look easy, lol! This is a great how-to write-up, Maria! Thanks! Great use of those pretty papers! What a cool idea. Must try the spinner inside. New thinking! Great! Like your idea! What fabulous card design and idea! I love it! Having the dies will really help in cutting out the designs. 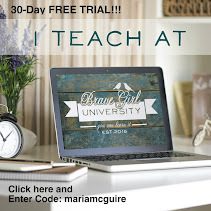 Maria - I just LOVE your tutorial! So clever and you always have the best details! 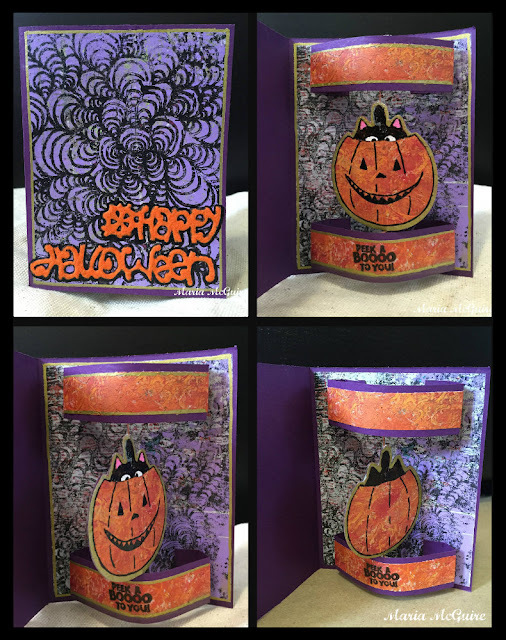 The colors you used and the Gelli Print are fabulous! Thank you for joining this special hop! And I agree ... the dies!!! LOL :) Hugs to you! Amazing card!!! Thanks for the tutorial!! What a unique design! The texture on the pumpkin is really cool! First inside spinner I've seen! What a great idea! Thanks for the great tutorial! Really like the way you put the pumpkin in a spin! So so cute! And love how your color the pumpkin, super cool! This is super cool, Maria!!!! I love the texture and design!! Fantastic! So happy you joined us for the hop!! Love the detailed instructions!!! 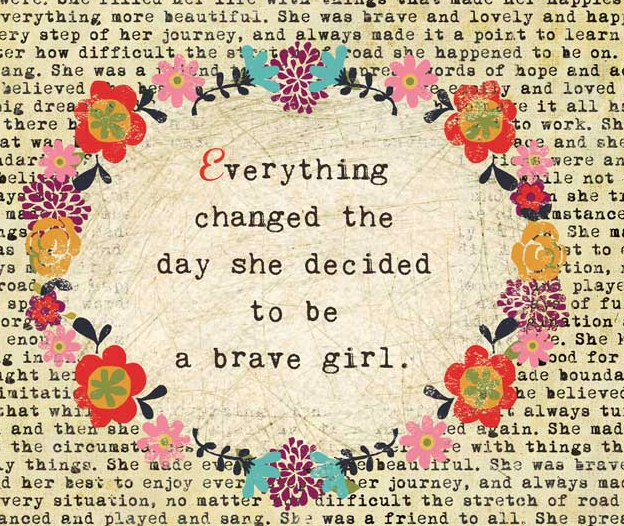 Awesome card...Inspiring to me! Too cute! And you did such a great job with the stepped out instructions. Oh wow!! What a unique card!! Love how you did the pumpkin too!! Great tutorial, also!! That textured card stock is amazing and works wonderfully for your pumpkin. Love the background paper, too. Wow, fun idea for the spinner image, Maria. Thanks for sharing the tutorial as well. 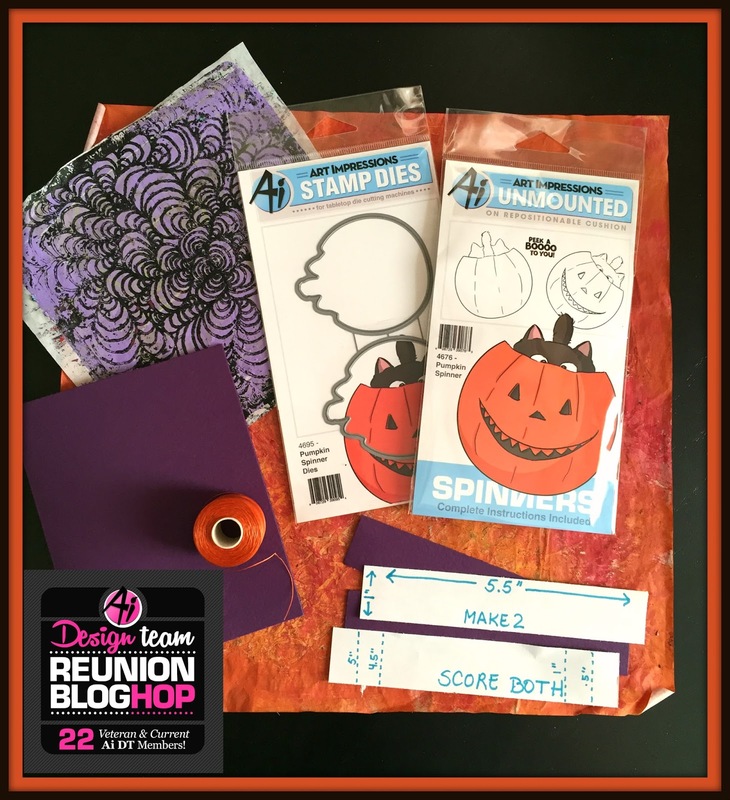 Love this creative card...perfect for this fun spinner stamps!! !